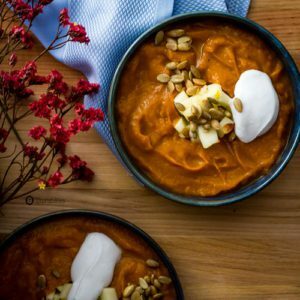 Roasted Pumpkin Bisque is a thick vegetarian soup made by roasting real pumpkin along with Greek Woodland Honey with Sage, Eleon Greek EVOO, and Ras el Hanout for an added warm Moroccan flavor. Cooked with apple juice and vegetable stock, this Fall soup recipe is perfect for Thanksgiving dinner. Gluten-free, dairy-free, and paleo friendly.